I recently found a set of old bias-ply tires which I think are from the 70’s. Looking over these tires makes you realize how far tire technology has come in a relatively short time. I find something like this quite interesting because its a little history lesson in automotive technology and also shows the level of thought at the time. 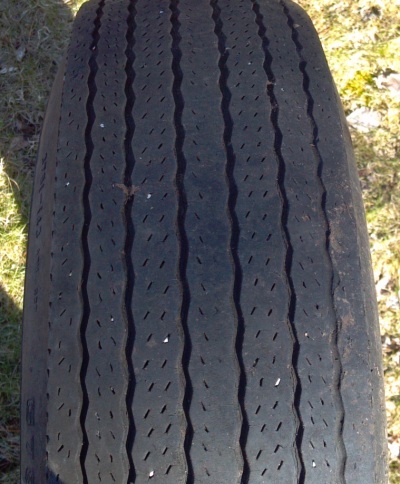 The most striking part of this tire is probably the tread pattern. When I saw it, I immediately thought “what were they thinking when they designed this tread?”. 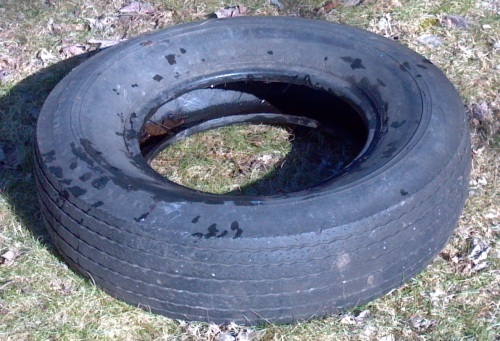 This tire came off of an every-day commuter car and was probably considered an all-season tire. Though, the tread looks like it would only be good in summer conditions due to the lack of lugs or sipes and almost looks like a historic race tire. I would guess that the slightest amount of snow would result in a devastating loss of traction and would make even leaving your driveway an adventure. Because of this, winter tires were a lot more common back then than they are today; but as you would guess, they were also very primitive lacking the closely packed blocks and sipes of modern winter tires. These winter tires were also known to produce strong vibrations and generally very uncomfortable. I am also not aware of any dedicated summer-only high-performance tires that were available at that time that are similar to what we have today. Because tire technology has come so far, performance numbers of historic cars have to be taken with a grain of salt because they were run on the tires of the era. Its hard to say what the same car would do on modern tires; it may work well with some, while not so well on others due to the suspensions not being optimized for the new tire. I have heard stories that I was never able to corroborate about historic race cars bending control arms when fitted and run with modern tires due to the higher G’s they were able to pull – I’m not sure if its true, but it does sound possible. I have also heard that historic suspensions were designed with large scrub radii due to the old bias-ply racing tires having large, soft sidewalls with a lot of squirm. If a modern tire is fitted to a suspension like this, It could produce very heavy steering due to the stiff sidewalls causing the axis of rotation (the point the tire steers around) not being where it was intended.